I have a great studio in the historic Lawrenceville section of Pittsburgh. Every time I walk up the old circular staircase to my second-floor studio I get a sense of how people lived a hundred years ago. It has large, north facing double hung windows with the original glass panes. Sections of interior walls reveal layers of wallpaper that were once used. This building was built to last. That’s how things were done in 1881. My studio is open to visitors by appointment. Besides the comfortable studio space, you’ll find quite a bit of work here that is not featured on this web site. I enjoy sharing my art and my studio. People comment on how many paintings I have. Then I remind them I have been painting for the better part of 30 years. A few years ago, I had the opportunity to double the size of my studio. The extra space allows me to exhibit a lot more work, especially the large paintings. 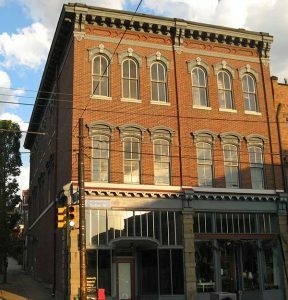 Lawrenceville is full of unique shops and great restaurants. In fact, Money Magazine named it as “The Coolest Neighborhood in America Right Now.” The building is a bit raw inside which makes it perfect for an artist. It’s worth a visit just to see the space and experience the neighborhood.